The Devil's Crown is a thirteen-part drama series. Produced by the BBC, Radiotelevisione Italiana, TF1, Time-Life Television Productions, Télécip and Télévision Suisse-Romande, it was first broadcast on Sundays, from 30 April to 23 July 1978 (BBC2, various times). Zoe appears in episodes six (entitled 'Richard Yea-and-Nay'), seven ('Lion of Christendom') and nine ('Bolt from the Blue'). The Devil's Crown is an ambitious dramatisation of the life and (often brutal) times of the medieval Plantagenets, a supremely powerful European family. Its members were known as 'The Devil's Brood', on account of a legend about their being descended from the Devil. The series focuses on the reigns of Henry II and his sons Richard I and John I, rulers of England and areas of France during the twelfth and early thirteenth centuries, and is unflinching in its portrayal of the bloody events that shaped medieval history. 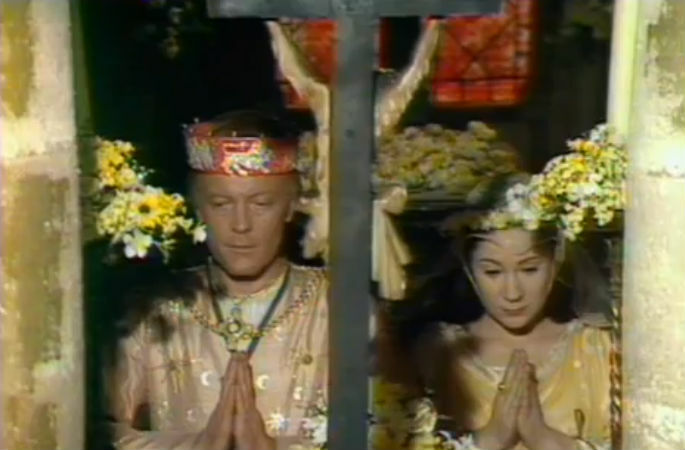 As the Radio Times explained when The Devil's Crown was broadcast, the writers' 'chief objective was to breathe some life into these remote historical figures'. In the words of the series's co-writer Jack Russell, who wrote the episodes in which Zoë appears, 'This is the story of an unhappy family who happened to wear crowns'. When Richard succeeds his late father to the throne, his mother, the steely Eleanor of Aquitaine, goes in search of a wife for him, despite the fact that he is clearly more interested in battles than brides. Zoë plays the young Princess Berengaria of Navarre, chosen by Eleanor to be Richard's wife. As Navarre borders on Aquitaine, the match helps to secure some of the borders of Eleanor's ancestral land. Characteristically brusque, the elderly woman arranges the marriage with businesslike efficiency; she is hampered only by the confusion at the court of Berengaria's absent-minded father, Sancho VI, about which of her sons she wants the princess to marry. Petite and short-sighted, Berengaria is convinced that she is thought of as 'a very little, ugly, dark thing'. As she prepares to meet Richard for the first time since childhood, the princess's immaturity is evident in her shyness and awkwardness. Perhaps Eleanor has deliberately chosen a daughter-in-law who is unlikely to challenge her own considerable influence over her son. Certainly, Berengaria lacks the confidence and poise that would serve her well as the wife of a king. Once married to Richard, however, the young woman is forced to grow up quickly (although a degree of childlike innocence remains in the frequency with which she dissolves into tears). While not particularly unkind to Berengaria at first, Richard is guilty of indifference towards her. The king (known as Richard the Lionheart, because of his formidable reputation as a warrior) is too preoccupied by the Crusades to pay a great deal of attention to his wife, leaving her isolated and far from home. From the outset, Berengaria's purpose as Richard's wife is to provide him with strong, healthy heirs, but a combination of misfortune and the widening emotional gulf between the couple means that she is sadly unable to do so. The shock of seeing Richard fall dangerously ill causes Berengaria to lose the baby she is carrying. As Richard recovers, he grows ever more distant from his unhappy, lonely wife. 'I love him, he doesn't love me,' she laments to herself. Berengaria sinks into depression, and only the smiles and jokes of Richard's charming brother, John, bring comfort. Reflecting on the state of her marriage, Berengaria wonders if Richard wants to divorce her. The cast is very large; above is a partial list. On account of the vast geographical scope of The Devil's Crown, as well as the difficulty of evoking a period in history that is so remote from a modern audience, producer Richard Beynon decided against traditional techniques such as location filming in favour of an innovative approach. As the Radio Times explained when the series was broadcast, medieval images - from tapestries, illuminated books, stained glass windows and so forth - inspired the creation of 'stylised backgrounds to the real drama taking place in the foreground'. The series therefore boasts a bold visual style, with changes of location signalled by the appearance on-screen of artwork in the style of medieval illustrations. 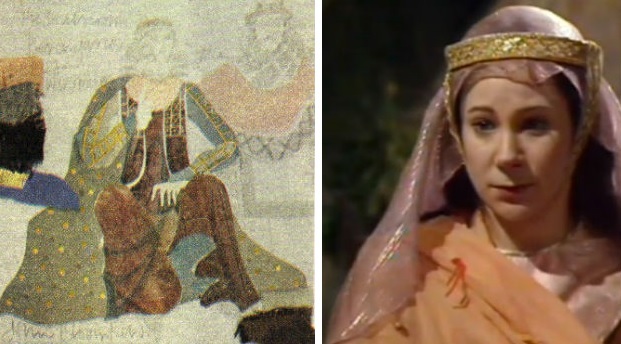 In addition, some scenes (such as Richard I's and Berengaria's wedding, shown above) give viewers the impression that they are looking at beautiful, detailed pictures. Some of the costume designs, too, are bright and striking (such as the drawing below by John Bloomfield, a design for Zoe's character, accompanied by an image showing part of the finished costume). Painted backgrounds, reminiscent of medieval illustrations, are used to represent many different locations. For example, when Berengaria contemplates a sea voyage, ships on the water, drawn in the warped perspective seen in period images, are visible from the window behind her. The backgrounds are complemented by tilted floors, as well as multi-purpose units resembling arches, battlements, turrets, etc. The units are arranged in various combinations, according to the demands of each scene. The scenery, as the Radio Times commented, is designed 'to achieve that curiously distorted effect that you find in contemporary illustrations'. Ken Taylor, who wrote the first five episodes of The Devil's Crown, also penned the script for Turn of the Year - 'Sally for Keeps', Zoe's first TV appearance. The Stage indicated that The Devil's Crown's writers achieved their chief objective for the series when it commented that 'lewd and crewd, courtly and majestic, the Plantagenets have been brought to life in this innovative version of their times'. Praising the performances given by Zoë and Jane Lapotaire in the series, the Daily Express quipped, 'These two ladies are likely to win crowns elsewhere in the television world.' The prediction proved accurate, not least when they received widespread critical acclaim in both the play Piaf (performed from 1978-80 in the UK and in 1981 in the US) and TV drama Love Hurts (1992-4). The Devil's Crown, dubbed into French, is available on DVD or to download from France's National Audiovisual Institute. The organisation has also made several clips from the series available to watch on its website. The book The Devil's Crown: A History of Henry II and His Sons by Richard Barber was produced to accompany the series.